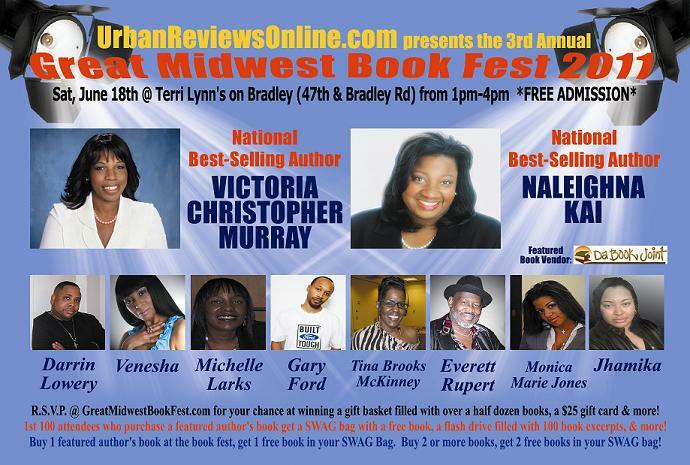 The headline authors for the 3rd Annual Great Midwest Book Fest are National Best-Selling Authors Victoria Christopher Murray and Naleighna Kai. Other authors in attendance include Darrin Lowery, Venesha, Michelle Larks, Gary Ford, Tina Brooks McKinney, Everett Rupert, Monica Marie Jones, and Jhamika. YOU CAN EVEN RSVP RIGHT NOW IN THE WIDGET AT THE BOTTOM OF THIS POST! All of the featured authors will have a limited number of books available for sale. They will vary from Contemporary Fiction, Women's Fiction, Non-Fiction, Christian Fiction, Poetry, Street Lit, and more. This event will be CASH ONLY.The book vendor may be taking other forms of payment, but they will only be carrying a selection of books by the two headline authors. Buy at least one featured author's book at the event from the authors themselves or from the book vendor and receive a SWAG BAG filled with promo items (pens, bookmarks, postcards, etc) as well as a random FREE BOOK from one of our sponsors! If you buy 2 or more books, you will get 2 FREE books in your SWAG bag! Limit 1 Free SWAG bag per attendee and there will only be 100 bags available...so buy your books early! Everyone in attendence will receive a Souvenir Ad Program featuring author bios, a complete listing of books released by each of the featured authors, information on our sponsors for the event, and contact info for those that want to learn more about the featured authors, the sponsors, or Urban Reviews. There will also be Door Prizes given out to those that pose for a picture for the website, give their video comments about the event, or who are simply picked out at random. The prizes can be anything...like a free T-Shirt, a free book, etc! PLEASE take the time now to help spread the word about this event. There are links on this page as well as on your RSVP confirmation page that enable you to send out emails to your friends, family members and co-workers as well as post the information straight to your Facebook, Twitter, or Myspace accounts. We will be doing aggressive promotion via the community newspapers, libraries, Facebook advertising, and flyers around town. Go to http://www.greatmidwestbookfest.com/ for full information!